This entry was posted in animal shelters, Cat adoptions, Cat blogs, cats, Pet blogging, Siamese cats, Top 50 Cat Bloggers and tagged Alberto, cat cudles, cats cuddling, cats in boxes, cats in silly sitting positions, jasmine, Lily, Oliver, The Tribe of Five, Tucker by Feline Opines. Bookmark the permalink. Thank you, the Female Human says she’s “visual” whatever that means and she likes to see pictures. We think it’s just because we are all so handsome! Great fill-ins ! You are all so thoughtful of each other and the Human. We enjoyed all of those answers and loved the photos! 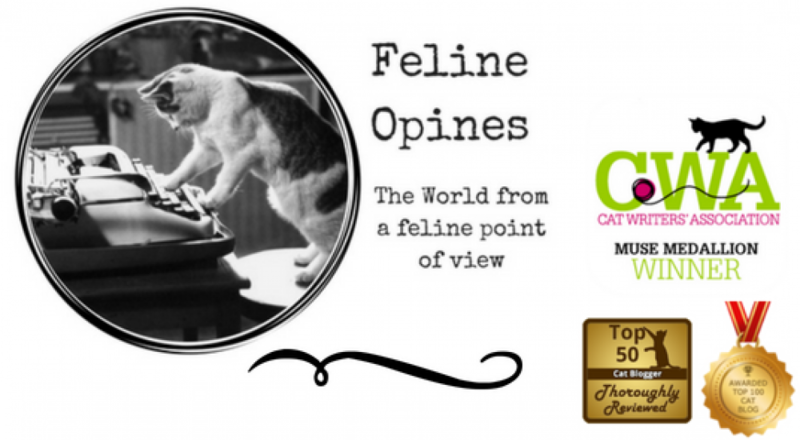 Thank you, the Feline Human is hoping to up her photography skills at the BlogPaws conference next week. Those sofa photos are hilarious! He does these poses on a regular basis, he‘ such a goof ball! We agree, boxes are the best and we manage to squeeze ourselves in all of them! The Female Human here, yes, we love watching the box sitting as much as they enjoy hanging out in the boxes! They can be really funny in those boxes. Our Angel Xerxes used to try to close himself up in the boxes, pulling the flaps down with him. Purrs & Head Bonks to you! Our Xerxes loved boxes. Martha seems to love them, too. Have a great week. We have yet to meet a fellow feline who does not love boxes, it’s a cat thing!